Let me introduce you all to our future fishing professional. I had my regular client Matt on the water the other day to fish Tampa Bay. He brought along his two young sons 8 year old Mason and 5 ½ Cayden. Cayden made sure that I get his age correct. Not 5, 5 ½. Both were great to fish with. We started our day off with some trout fishing. We were fishing live shrimp on an 18” 25lb Berkley Fluorocarbon leader under a Cajun Thunder popping cork with a #1 Daiichi circle hook. The popping cork does a couple of things. First, it keeps the bait out of the grass and in the middle of the water column and second, when you pop the cork, it makes a sound that attracts trout. It is my go to rig when fishing Tampa Bay trout. The trout bite has really turned on in Tampa Bay; we fished and caught trout until we ran out of bait. As the tide rolled in, we moved on to some redfish. The conditions weren’t ideal in Tampa Bay for looking for schools so we fished a few mangroves that hold fish. Our fist stop produced a nice catch. 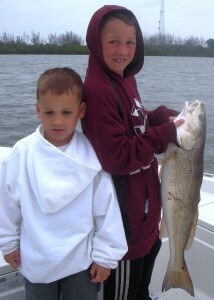 Manson did an awesome job fighting the fish away from the mangroves and landing a beautiful over slot 30” redfish. Tampa Bay produces some good redfish action and it’s not uncommon to catch an over slot fish. The weather rolled in and the bite slowed down so we called it a day. Thanks to Matt and look forward to fishing with the young guys next year.